Dye based inks make perfect film positives. MaxBlack™ UV Resistant Dye Ink is perfect to turn your pigment based printer into an image setter quality printer. Or, with your current dye based printer, save money with high quality MaxBlack™ products. Our MaxBlack™ UV Resistant Dye Ink is specially formulated for printing on clear film like MaxBlack™ and is designed to be quick drying, scratch resistant, and have excellent UV blocking characteristics. MaxBlack™ UV Resistant Dye Ink is a safe, non-toxic water based ink which is solvent and odor free. 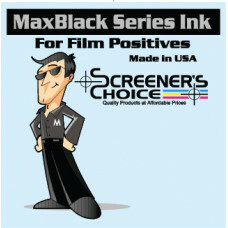 MaxBlack™ UV Resistant Dye Ink is the best ink on the market for film output on inkjet printers.